Panasonic isn’t exhibiting at Cebit fair for the first time for years but wanted to show something new and just announced: The thick and lightest ruggedized convertible Tablet PC ToughBook CF-C1 with bright non glare 12 inch screen and a weight of only 1.46 kilo with one, 1.69 kilo with two batteries, giving claimed 5 to 10 hours of battery life. The C1 has been announced very early, it will be released in July and September and cost about 2500 US-$ or 1800-2200 Euro, depending on the screen and chosen input technology. 3G modem is an option, CPU is not, the C1 will be offered with a fast and power saving Core i5 520M (2.40 GHz with Turbo Boost up to 2.93 GHz). Powerful enough that you normally would not need another desktop PC. Windows 7 performance rating is 3.6. Touch input supports two fingers. Tablet-profi.com had the opportunity to sit together with Stephen Yeo at Cebit in Hannover this week. Panasonic’s European Marketing Director put a “hand made prototype” on the table. First thing me thought: Wow, yes, indeed very light given the size and appearance. Perhaps this is a new category: thick and light, very light and comfortable to hold thanks to a ribbon stripe. 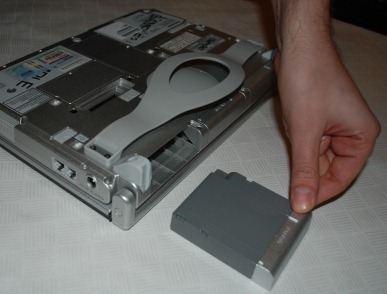 After an hour of little work the CPU had to do (typical scenario for data input) the case was still very cool, on top where your palm sits when typing as well on the bottom where you hold the ToughBook when entering data on the go. Very well done. Another nice and useful detail regarding durability and stability: There are two hinges, one for turning the display up and down, the other one enabling rotation. The latter may be manually locked by the user. Advantage according to Panasonic: There is a much better pressure distribution when you move the display back and forth, the hinges last longer. There were some drawbacks due to the prototype state so that there is no need to dig deeper (case fit and finish, non final keyboard, touch screen responsiveness, view angle) or to comment as that would be unfair. The round touchpad has always been disputed, my issue is that it is small: with default mouse settings you cannot move the pointer from the right to the left side of the display with just one swipe. 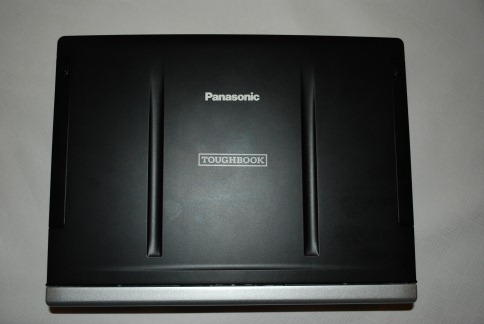 Interestingly in the press release Panasonic claims the thick convertible to “look great”. While we will not comment on this we recommend to take a look at the pictures we took. The two main thickeners are the two pedestals and the batteries. Pictures from 2010, not 1999 (OK, you might take that as a comment). The digitizer looks and feels cheap, this will hopefully change until mass production. Some ruggedized notebook companies always claim their devices would survive when dropped from a height of 76 cm. We’re not sure why we would always bend before we drop something. For future models we’d wish: 76 cm is not enough. 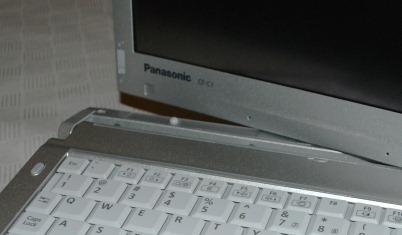 Panasonic is aware that convertible Business Tablet PCs are a niche market. But they want to enhance the market to assure growth (as prices are going down due to competition and indirect influence from the netbook market). Disadvantages: Cannot free HD from cage without loosing guarantee, little touchpad, new docking stations, thickness, no USB 3.0. You can find a good German hands-on here at Golem.de.